The videos will be uploaded my YouTube channel and the Facebook Page associated with this blog as well as embedded here on my blog. Thank You to the new responses, of which we learned a lot. The seventh episode I especially liked. We hope to continue to learn from you. I hope that you will continue doing so. As always, it’s good to hear from you. I’m happy you enjoyed this video and you learned from it. Thank you for the feedback. Great blog. Road kill deer. What a great off the cuff answer. With big game chilling to 7 degrees through out the meat should take place within 12 hours. Evisceration should be done at best practice within 45 minutes. Examination of the red and green offal should be done by someone in the know. Injuries that may look like they have been caused by a collision might have been there before and overlooked. One critical point with road kill is the fact that you have not observed the animal before it has been killed. This can tell you a lot about the animal and its health. The chilling is a big one when in you think the average temperature in Ireland anyway in December is 8 degrees. Small game road kill is a a different thing altogether with a lower chilling temperature. Great Paul . Thanks for another great blog. Hi Victor, thanks for your comments and adding to the conversation. In particular you make a good point about not having observed the animal while it was alive and all that can be gleaned from this. Indeed, why was the animal involved in a fatal road collision? Was it slow due to injury or illness? These will obviously be harder to glean from a dead deer than a live one but as you say, it’s a critical point. Thanks again for your comments Victor. Enjoyed this episode very much – many thanks for the info. Glad you enjoyed it. Thanks for the feedback. Thanks again for a great video. I wish you had some courses in the US. Right now a trip to the UK is not in the budget, but perhaps one day. But in the meantime, I will be looking for any of your books. Thanks for the kind words. Understood regarding the distance/cost of travel. Keep checking back here for regular updates. I really enjoyed another episode, I looked up selfheal straight away. I’m sure it’s in the masterclass, I’m up to date but I’m guilty of needing to re watch the modules and revising my notes. I’m on the hunt to find some selfheal now. I was also interested in the sighting mirror on the compass, my knowledge on navigation isn’t very good, it’s something I really need to dedicate some time to. Any tips or further reading are always welcome. Glad you liked episode 7. So, is navigation next on the list of skills acquisition? That and first aid Paul, both are pretty vital but which one first? Choices. Thanks for those answers Paul, really usful. I always enjoy the Ask Paul posts. Further to the road kill question, will we be seeing a post on preparing wild game and inspecting the carcass for disease. Would be both useful and interesting. Ps Glad to see you laughing. It’s good to be laughing Adrian. I was actually recently looking to purchase some paracord with reflective material in it, so it was great to have your input on it. In my last camping trip I used some bread plastic clip on which I put some reflective tape so people wouldn’t trip on my lines. No problem Marc-André, I knew who it was once I checked the system back at home again. Looking forwards to your next question. 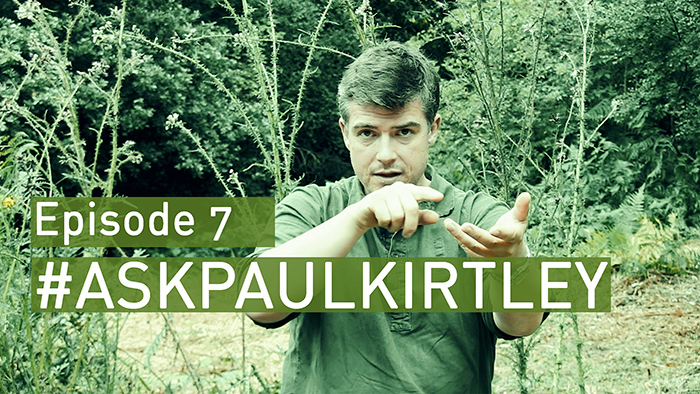 Another great episode Paul I particularly enjoyed the bushcraft instructor part great information, the medicinal plant section was also good to listen to. Good to hear from you. I’m glad you are enjoying these sessions and thanks for your comments on this one in particular. I like the episode 7 where you mention about instructors and over stretching them self. You are right, some people do just jump in things and not realize what it takes to teach some one and end up shooting them self in the foot. A old army saying is if you are asked question you can always answer it by simply saying, I can’t answer that question right now, but I will endeavor to get a answer for you as soon as I can. Its really not that difficult. No one can know it all and there is always some thing new to learn. Hi Ian. Agreed – it’s a useful and honest technique. Interesting. I’ve not used meadowsweet for this purpose but I’ll give it a try. Thanks Pär. excellent, clear and useful answers all ‘off the cuff’ – surely the sign of a great teacher! More and more, I feel sorry I’m unable to attend one of your courses; unfortunately, I now live and work as a field biologist in the Czech Republic…though that has its own benefits. I was particularly impressed with the answer on road kill. I would add that, in many countries, particularly here in mainland Europe where hunting is more widespread, carcasses of game species automatically belong to local hunting associations. All kills, however occurring, must be registered to allow population estimates. Anyone found in possession of a game species that has not been handed in/registered can be subject to large fines. Furthermore, anyone found in possession of protected and rare species (such as otters or European mink), dead or alive, without specific permission is also liable to prosecution. Regarding medicinal herbs, I would add both thyme and sphagnum moss; both are antiseptics and the moss has long been used as a wound dressing. Thanks for your comments on the episode and the series in general. Thanks also for your additional observations. Agreed re sphagnum – the king of mosses. What is your area of work/research? Hi Paul, very informative episode.